On NE 162nd Street sits a little house sandwiched between The Good Year Tire Company and Fulford Elementary School. This cramped location in North Miami Beach, Florida is where my Grandfather, Nunzio Capizzi, also known as “The Baron,” lives and runs his barbershop. After 55 years, my Grandfather has accumulated an extensive collection of eclectic memorabilia in his house and shop such as, politically incorrect signage, forgotten dentures from customers, trophies and patches from bowling tournaments, and political signs used as boxes for his plants. He navigates through these objects and continues with his daily routine of cutting hair, watching television, tending to his garden, cooking, and most importantly, smoking cigars. Three years ago, when I began taking photography classes, I turned the camera on my family. I became interested in capturing the scenarios that unfold in their daily lives. With camera in hand, I was both a fly on the wall and an active participant in these scenes. As I continued photographing, I realized that the star of my photography was my Grandfather. I began paying close attention to his life in and out of the barbershop. Despite living with chronic pain due to spinal stenosis, he continues with his routine. Photographing my Grandfather gave me a new perspective on my relationship with him. 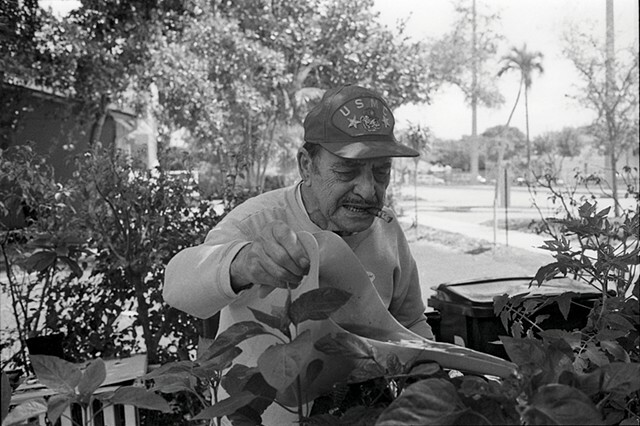 He allowed me to enter his personal world – following him as he gardens and sneaks cigars (he is not supposed to smoke and cuts the cigars in half to “minimize” the effects), catching him eating out of the ice cream container, as well as his most vulnerable moments when his daughter and caretaker, Annette, stretches and massages him. The nuanced qualities of my Grandfather’s life were the same qualities that caught my eye and inspired me to capture the delicate subtleties of his daily routine. Through these photographs I have composed a photographic story of his life at 91 years old.